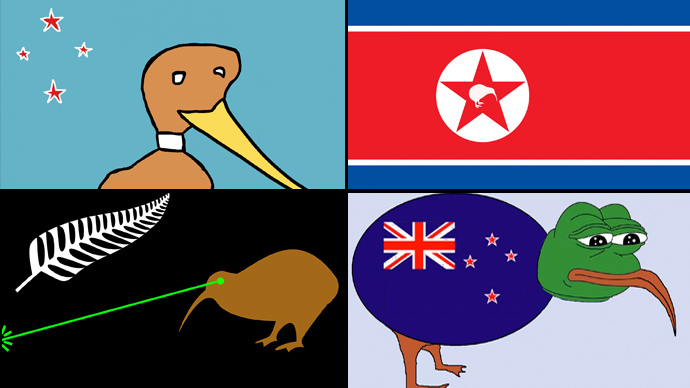 Hundreds of suggestions for a flag to replace New Zealand’s current national symbol featuring the Union Jack have been submitted to the country's government, with the flightless bird Kiwi being head of the pack. During the official Flag Consideration Project, which will run through the year and in early 2016, options for the new national symbol will be considered in three stages. Until mid July, New Zealand citizens can submit their flag designs – with nearly a thousand suggestions already having been put forward since early May. While some have taken the task seriously, a number of alternative designs featuring sheep, ice cream, rainbows and laser beams have also been submitted. Whether the designs recalling Chinese, Vietnamese and even North Korean flags will get a chance to become the new flying symbol of the nation, will be clear by the end of this year, when the first stage of a national referendum will be held, in which people will choose between four alternatives to the current flag. The final decision will be made in a March 2016 vote. The current New Zealand Blue Ensign was adopted in 1902, with the Union Jack in its first quarter recognizing the country's colonial past as part of the British Empire. Earlier this year, Fiji announced that it would remove Great Britain’s Union Flag from its own national banner. Canada replaced the Union Flag with its current Maple Leaf in the 1960s, while Australia is still debating whether or not a new state symbol should be introduced.